Festival history is displayed at Headroom Stages in July in an exhibit of posters, programs, and news articles. 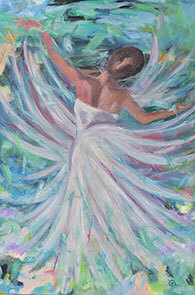 Siiri Lane's paintings of dancers are featured at Vermont Artisan Designs and Latchis Gallery in July. The 6th annual Southern Vermont Dance Festival (SVDF) is preparing to celebrate the breadth and beauty of movement with a four-day schedule of classes, performances, community events, and more in Brattleboro on July 19-22. Preparing the way is "MOVEMENT 2018," a seven-venue installation of twelve exhibits featuring "movement-inspired art of all kinds." Beginning on Gallery Walk Friday, July 6, and continuing throughout the month, these venues are showing work by six artists who celebrate movement and dance in photographs, paintings, glassware, and more—some work will be available for sale. Jeff Lewis's photos of Festival dancers in 2017 are featured at Mocha Joe's. The Southern Vermont Dance Festival was birthed out of the aftermath of Tropical Storm Irene and the Brooks House Fire, and has an equal focus on promoting the arts and art excellence, and being an economic driver for the community. BRENDA LYNN SIEGEL, Executive and Artistic Director of the Festival, has a degree in choreography from Hampshire College and has worked as a choreographer, administrator, and dance teacher locally and around the country. While Modern Dance is her specialty, she also teaches Jazz, Break Dance, Hip Hop, Ballet, Belly Dance, and Astanga Yoga, and for over a dozen years has run a popular Break Dance camp for local youth. Seeing the need for a consistent and concerted effort to revive and help sustain the local economy, she decided to concentrate her effort where she knew best and in the community with which she was most familiar. Siegel knew that dancers would come, that they would shop and eat, and would be excited about Brattleboro's downtown community. And she knew that she could excite the community about dance. In its 6th season, the festival goals have been realized. Perhaps you love to watch dance—there are Galas galore. Maybe you have never walked into a studio in your life, but you would really love to learn—there are classes for you. If you are a dance professional or dance student, there is a wealth of works to see and classes to take. With four days of ticketed and free performances, over 90 classes, and a strong focus on community, this year's festival is ready to inspire! The festival boasts faculty and choreographers at the top of their field with a unique ability to serve all levels of dance, from the dance enthusiast to the dance professional ... and everything in between. For the sixth year in a row the festival will host some major players in the dance world. SVDF is highlighting the beauty and strength in our differences by celebrating diversity and social justice: Five-year veteran DORCAS ROMÁN, a Puerto Rican dancer-choreographer, has been active in dance and theater for more than 23 years. She currently serves as artistic director of the Dorcas Román Dance Theatre (DRDT), a company that has received high praise from the national and international press. SVDF is also excited to welcome back ADRIENNE HAWKINS, who has won many choreography awards and created over 50 dances for the Impulse Dance company. She has also set works for the National Ballet of Ireland, Ballet Plus, Dance Express of Denmark, Northwest Florida Ballet, and Portland Ballet, to name a few. Featured events include the OPENING GALA at 4:30 on July 19 in the Latchis Theatre. An excellent event for families, this performance presents a variety of local and national artists offering an experience of dance through many lenses. The spectacular FRIDAY GALA at 8:00, also on the Latchis main stage, presents powerful performances by artists from around the country—described by many past attendees as a show at a calibre normally seen only in city venues. Advance ticket purchase for both galas is strongly recommended. Other hightlights include a Mid-Summer's Night Picnic & Promenade performance at Scott Farm that sells out quickly, so order your tickets early. In addition, a YOGA TRACK has been added for those preferring that movement form. Also new this season are a COMMUNITY POTLUCK dinner, a Social Justice/Resistance PERFORMING ARTS TOUR of downtown, and a mini DANCE FILM FESTIVAL. There are literally dozens of performances, community events, art exhibits, and classes! Southern Vermont Dance Festival has made its focus one of driving the local economy, and this year it is asking the community to give back, to say loudly and clearly that it wants SVDF to continue this focus on community growth and diversity. All are welcome to become involved in this year's festival by giving generously, by volunteering, or even by hosting an artist. To purchase a festival pass or tickets to the galas, check out SVDF's website at http://southernvermontdancefestival.com, and get in touch by email at info@southernvermontdancefestival.com. Be sure to get your tickets and passes early! This year's multi-venue exhibits not only offer a reason for folks to explore the downtown but also present movement through different mediums, once again showing that dance is for absolutely everyone. "Movement in its freest sense is open to all of us—the joy, the emotion, and the art. Everyone should have access to movement, whether it be through visual art, dance, yoga, or watching performance. Access to dance should reach everyone and be approached with community in mind," says Siegel. Explore and enjoy!